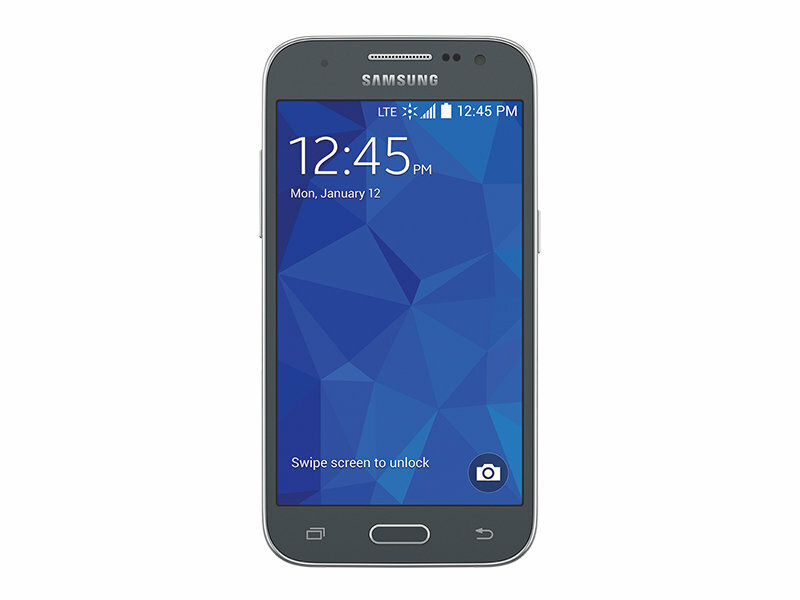 The Samsung Galaxy Core Prime S820L is an affordable 4.5-inch smartphone from Samsung. It ships running Android 4.4 KitKat and powered by a 1.2GHz quad-core processor. It's a CDMA phone that activates on Verizon cell towers. 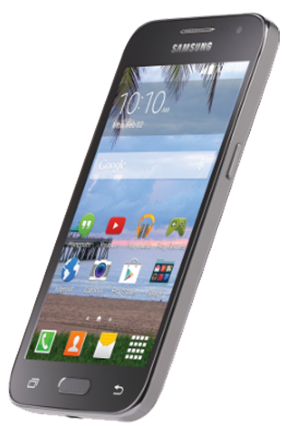 If you are looking for a 4G LTE phone with a bunch of other great features, then you will love the Samsung Galaxy Core Prime. Read on for my hands-on review. Your Samsung Galaxy Core Prime S820L is available from Straight Talk and Tracfone Wireless website paired with unlimited wireless plans discussed later in this review. So opening the box, we have the handset, battery, power adapter with a USB charger attached, a separate standard USB cable, a pair of headsets, manuals and straight talk service guides. It boots up in a few seconds and setting it up is pretty easy - in under 10 minutes I was able to use the device. Samsung Galaxy Core Prime S820L has an elegant, slim and sleek design with smooth curves. The slightly rounded corners and brushed metallic bezel going around the phone makes it a device to behold. It is a 4.5-inch device with a TFT display sitting on the front. At the top of the display, we have the front facing camera. The lower part of the display sits the three navigation buttons; the recent apps button on the left, physical home button in the middle, and the back button on the right side. Coming to the sides, you will find your power button on the right-hand side and the volume rockers on the left-hand side. The headphone jack together and the noise cancellation mic are located at the top side of the device. You will find the charging port as well as your microphone at the lower part of the device. The back cover holds the speaker and the Camera with a LED flash. 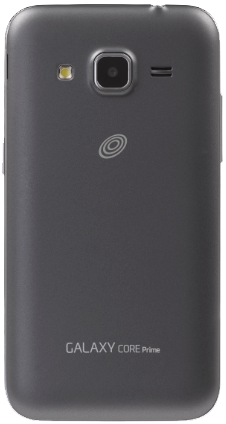 The back cover is removable to reveal the battery and microSD and SIM slots. On the Samsung Galaxy Core Prime S820L is 5MP back camera and a 2MP front camera. The phone's camera has some of the most amazing features you can expect to find on an entry-level phone. The camera includes up to six modes you can adjust when taking pictures. While in the camera app, you can tap the mode button to show the list of the modes to select. They are Auto, Panorama, Beauty Face, Best Photo, Continuous Shot, and Sports Mode. You can also experiment with the settings to adjust things like geotagging, photo resolution, exposure time, grid lines, ISO and metering, and white balance. Personally, I like the camera because it has most of the features I need in a phone’s camera. A point to note: the camera on the Samsung Galaxy Core Prime S820L defaults to 3.9MP and not the full 5MP, so be sure to change this in settings to enjoy the full power of the camera. I have used the phone for a while and I like the brightly colored outdoor photos it takes. Indoors, the pictures may be slightly gray, but with the LED flash setting activated, the camera produces fairly good pictures. For selfies, the 2MP front camera comes in handy. It's pretty short on pixels, but it's a good camera for a phone in this price range. While indoor snaps may appear a little bit low on resolution, outdoor snaps are bright enough. The video capturing quality on the Samsung Galaxy Core Prime S820L is at 720p. This is fairly good even for video calling which I do a lot. The phone captures amazing videos of outdoor sceneries. The phone features a 4.5-inch TFT display with a resolution of 800x480-pixel. This is a pretty compact phone perfect for single hand operations. I found the indoor clarity to be great; photos and videos are clear enough. Viewing angles are also fine indoors. Checking out YouTube videos, the display is crisp and I liked it. Also, it's worth noting the screen responds to the slightest of touches. The Samsung Galaxy Core Prime S820L holds a 2000mAh battery with a talk time of up to 22 hours and a standby of up to 14 days. In my daily usage, I found the phone's battery life to be impressive. With a full day of typical usage, the battery still had some small percentage to keep the phone on. My typical usage includes listening to music on the phone, texting, checking my emails and a few phone calls. Of course with streaming videos, using maps navigation and other apps that require constant internet will drain your battery, and you may have to recharge in like 5 hours. The battery is also removable, so in case you want, you can purchase a spare battery to replace when the primary battery runs out. You can find the ultra-power saving mode under phone settings, which when activated, the phone can stay for even more hours. Overall, the battery life on the Samsung Galaxy Core Prime S820L is impressive. The Samsung Galaxy Core Prime S820L has an internal storage capacity of 8GB. Additionally, it supports an external microSD card of up to 128GB - that's impressive. Depending on the amount of data you need to store on your phone, you can order for a memory card ranging from 2GB to 128GB. On my phone, I have the 64GB SD card which offers incredible storage space. Either way, the internal 8GB storage is still a lot and might even fit your needs. The performance of the Samsung Galaxy Core Prime S820L is impressive for a phone in its price range. It ships with Android 4.4 KitKat upgradable to Android 5.1 Lollipop and it's powered by a Qualcomm Snapdragon 1.2GHz quad-core processor. Onboard is 1GB of RAM. Given it has 4-cores, I found the phone to be very responsive. Animations in games and when switching between apps show up smoothly with no noticeable lagging. The data transfer speed is fantastic. The phone is 4G LTE enabled, so videos and songs stream quickly. Loading Google Maps is very fast. Also because of sufficient RAM, you can have several tabs open in your favorite browser, and still the phone remain responsive as you scroll through pages and menus. When paired with the Straight Talk plans, I experienced speeds of up to 40Mbps downlink and up to 20Mbps. With such speeds, there's no buffering on YouTube. By the way, you can test for internet speed using the Speedtest.net diagnostic app. On the navigation buttons, we have the recent apps button which brings in an element of multitasking. Switching between recently launched apps is very fast. Other features of the phone include Bluetooth 4.0, Wi-Fi, accelerometer sensor, proximity sensor, hearing aid compatibility, Wi-Fi Direct, and GPS navigation. In case you don't know, Wi-Fi Direct enables devices to connect with each other without requiring a wireless access point - this allows faster sharing of large files between your phone and another phone. Battery capacity 2000mAh. Talk time of up to 22 hours, Standby time up to 14 days. Internal Memory 8GB. Supports microSD card of up to 128GB. Dimensions: 5.16''(Height) x 2.68''(Width) x 0.35''(Depth) inches. 1.2 GHz Qualcomm Snapdragon Quad-Core Processor.